This past Saturday I joined with members of the NHAMC Paddlers in paddling the Merrimack River from Greeley Park in Nashua, NH up to Cromwell's Falls in Merrimack. Along the way and while hugging the west shore we continued looking for a campsite matching the one Henry David Thoreau described in his A Week on the Concord and Merrimack Rivers. It's marked HENRY 85-95. No idea if it has anything to do with their campsite or journey. 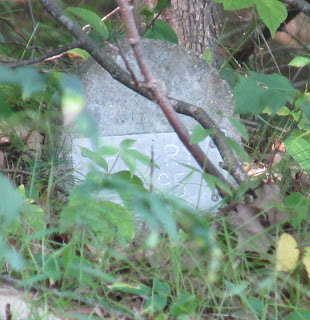 Others who've stumbled upon it speculate it's possibly marking the final resting place of someone's beloved pet named "Henry". On this day back in 1839 the Thoreau brothers had begun their return trip from Hooksett, NH back to Concord, MA. They would camp on this night about 5 miles upriver from Cromwell's Falls in the northern part of Merrimack opposite a large island. "We had gone to bed in summer, and we awoke in autumn; for summer passes into autumn in some unimaginable point of time, like the turning of a leaf." They pushed off from their campsite before 5am, and with help from a northerly breeze sailed and rowed approximately 50 miles to their home in Concord, MA arriving there after dark. That's a pretty respectable distance to cover in one day. Kept thinking the next one would stop me until I'd reached a point 3.25 miles up from the launch where one tree, spanning the river bank to bank, did just that. Another hint of civilization was the sound of gunfire from the nearby firing ranges of Fort Devens...which served as a fitting reminder that yesterday was the anniversary of 9/11.